So, with all those caveats out of the way, it is worth noting that Ernst & Young’s 2013 Europe, Middle East, India and Africa Fraud Survey is quite useful, both for its scope and for its findings. The recently released survey is based on anonymous interviews, conducted in late 2012, with 3,459 people from companies in 36 countries. Interview subjects ranged from employees to board members, directors, and managers. The majority of the companies surveyed employed more than 1,500 workers. For sheer breadth, the survey is noteworthy. The results are, too. Take, for example, the significant gap between how management view anti-corruption issues and how rank-and-file employees view them. At the board director and senior management level, 74 percent of respondents affirm that, “We have an anti-bribery/anti-corruption policy and code of conduct.” At the non-management employee level, that number drops to 51 percent. Similar gaps exist when it comes to the existence of penalties for breaking a firm’s anti-corruption rules (65 percent/43 percent) and the existence of a whistle-blower hotline (49 percent/30 percent). These gaps show that corporations remain vulnerable, even at a time when, according to a recent presentation at CIPE by two anti-corruption attorneys, worldwide awareness of corporations’ anti-corruption obligations is at a record high. One potential cause for this dangerous perception gap is touched up on in a recent CIPE Feature Service article article on the business case for corporate governance. 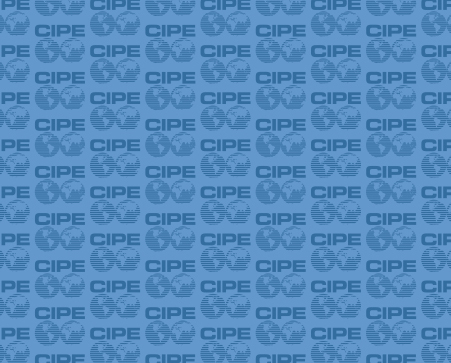 CIPE executive director John D. Sullivan and senior program officer Anna Nadgrodkiewicz make the point that when a firm’s approach to corporate governance reform is driven by a “search for benefits” the result is far better than when corporate governance reforms are driven by a crisis. This same point applies to companies seeking to protect themselves from the risks of investigation for corrupt practices by the U.S. Department of Justice, Great Britain’s Serious Fraud Office, or the Royal Canadian Mounted Police. The Ernst & Young survey gives two concrete examples of potential benefits that firms can reap from robust anti-corruption standards. The first is increasing the ease with which a firm can move into new, risky markets. If a firm’s anti-corruption program is strong and vertical, the firm can confidently engage suppliers and distributors in new markets, not only because internal controls are in place but also because the potential for reaching a critical mass of private-sector intolerance of corruption is higher. An example of this latter phenomenon can be found in a CIPE-funded program at the Thai Institute of Directors, which promotes collective action by some of Thailand’s largest firms. Even for laypeople not versed in the latest Talmudic interpretations of anti-corruption laws, one conclusion of the Ernst & Young survey is inescapable. A significant minority of those surveyed believe that their business can be fully competitive only in an environment where leeway exists on corruption and bribery. In rapid-growth economies such as Turkey, India, Russia and the Czech Republicl, Ernst & Young found that 21 percent of respondents believed that close adherence to their firms’ standards on corruption would result in harm to “our competitiveness in this market.” In mature markets, the number of such respondents dropped to 11 percent. Still, those findings are a clarion call to anti-corruption activists in all markets. The findings are also a signal to the lawyers, consultants, and accountants in the anti-corruption compliance field that business will be good for some time to come. Frank Brown is Program Officer for Eurasia at CIPE. Figures from the E&Y report republished with permission.